The Win-Win Special ENDS at MIDNIGHT tonight. Make a $45 tax deductible donation to the Enjoy Life Education scholarship fund by the end of today, April 22, 2019. Email me the receipt at janet@ExercisingWELL.com. I will send you a coupon code to receive your first month of the Exercising WELL coaching program FREE. The Enjoy Life Education Leadership Academy. It’s pay-it-forward week at Exercising WELL and we are running a Win/Win Special. 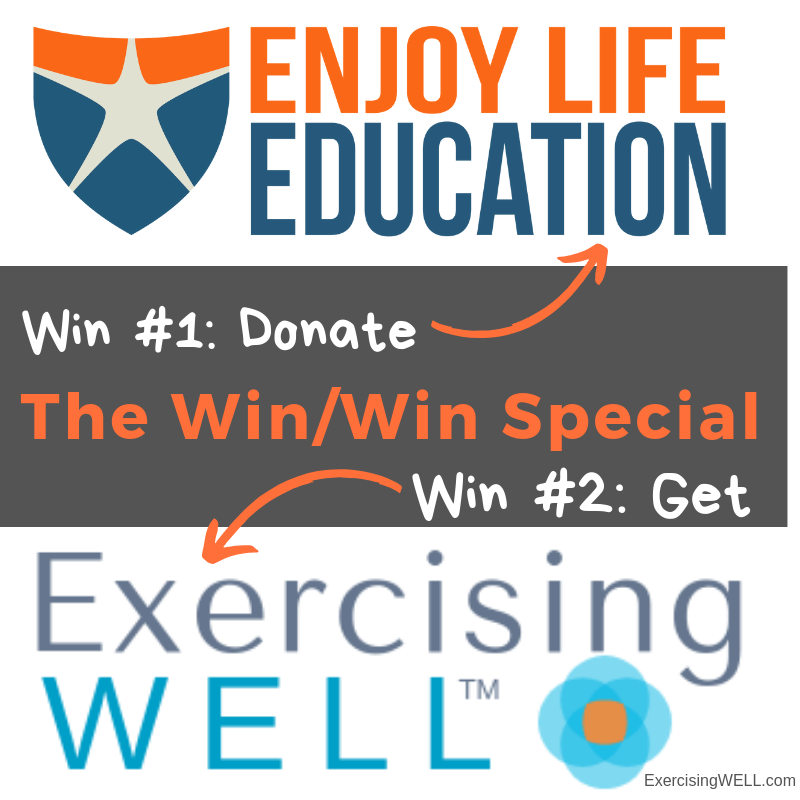 From now until April 22nd, 2019, when you donate $45 to the Enjoy Life Education scholarship fund, you get your first month of the Exercising WELL Coaching Program FREE. Confidence can be reliant on external sources or it can be an inner sense of knowing your own strengths. Studies show inner confidence is much more reliable and resilient through the ups and downs of life1. When you take advantage of the Win/Win special, you help a teen build inner confidence through the Enjoy Life Leadership Academy and grow your own inner confidence that you know how to be Exercising WELL. Students build confidence though a stronger sense positive self-worth. From the moment students enter the academy, they are encouraged to not only be who they are, but also celebrate who they are with confidence and pride. They not only do this for themselves, but for each other. Students are immersed in a culture of self-worth that builds a natural and lasting inner confidence. Check out this 60-second video to see how that is done. Exercise success often is measured by external sources, such as the scale, the activity monitor, or a fitness challenge. But studies show these external sources for confidence are like building a house on sand, washed away by the next stressful event in life. Through the Exercising WELL online programs and personalized weekly coaching, you learn research-backed strategies for being internally guided and self-motivated. You gain solid inner confidence for exercise that carries over to other habits for your health and well-being. What is the Self-Determination Theory of Motivation? Research shows positivity broadens your perspective, so you notice more opportunities, and helps you build long term resiliency1. When you take advantage of the Win/Win special, you help a teen build positive self-worth and inner confidence through the Enjoy Life Leadership Academy and strengthen your own positive approach to self-care while growing your inner confidence that you know how to be Exercising WELL. From the moment you walk into the Leadership Academy, you are overwhelmed by the energy of positivity—it’s contagious! Every moment is filled with this positive perspective and support for each other. Check out this brief video to see for yourself. This is not a Pollyanna-type positivity, where talking about negative experiences is taboo. This is the place where life’s challenging experiences are embraced head-on, through activities like group challenges and leaders sharing their stories of resiliency. Life’s challenges are transformed through positivity and help students build resiliency through positive qualities like curiosity, creativity, and empathy. Because our brain is designed to keep us safe by looking for problems, it’s easy to get stuck in the muck of life and stray from your best intentions to exercise regularly. This is normal but not helpful when it comes to building habits for well-being. Health coaching uses research from positive psychology to guide you to get yourself unstuck and avoid the swamp of self-doubt and frustration of life getting in the way. As your coach, I help you sort through your experiences with exercise each week in a way that you lets you use life’s challenges as a tool for learning how to exercise through the ups and downs of life. Research on habits shows that when something is a positive experience, it becomes a lasting habit. Making exercise a positive experience requires both an understanding of brain science and exercise science. This powerful combination is what makes Exercising WELL unique. The research on the benefits of mindfulness is wide-reaching and overwhelmingly convincing. We all can benefit from more mindfulness skills1. Teens growing up in this distractible world need it more than ever. As adults, we need mindfulness to adapt to this age of technology and distractions. A major component of the leadership academy is reminding students to live in the now. Students are constantly reminded to be present and encouraged to adopt strategies in their daily life to remember to make the most of each moment. The best part is that it’s done in a way that is fun, lighthearted, and enjoyable so students genuinely embrace living with more mindful presence. Since your body only operates in the present moment, exercising with mindfulness is the only way to know how to exercise. Because so many of the reasons we exercise are for future rewards, such as weight loss, it is easy to think that exercise is just something to ‘get through’ so you can check it off the to do list. Yet, this how we miss the most valuable tool—the wisdom of our own Inner Trainer. Check out how one Exercising WELL member describes her newfound enjoyment of exercise with mindfulness: “I had a sense of joy while walking up a hill this week. I just felt strong and right and totally absorbed in the great walk, no distraction trying to take the hill. It was almost an exhilarating feeling. Definitely well-being.” Through Exercising WELL ,you learn how to use your Inner Trainer to be self-guided through mindful-presence and exercise becomes a whole new, more enjoyable, AND more motivating experience. You don’t have to have a teen to know the struggles of teens today are more complex than ever before. The Leadership Academy gives teens the skills and confidence they need to be the best version of themselves. I have witnessed it in two of my children, it has rippled out into our family, our community and the world! My son’s experience is echoed in the sentiments of both academy alumni and their parents. Now, I am paying it forward! From April 15 to April 22, 2019, you have a chance to help ELE reach its goal of providing this experience to students who need it most through their scholarship fund. At the same time, you are helping yourself create the best version of you through Exercising WELL. Many of the same principles of ELE, such as positivity, mindfulness, and self-discovery, are woven into Exercising WELL. This is a chance for a Win/Win you don’t want to miss. Make a $45 tax deductible donation to the Enjoy Life Scholarship Fund between April 15 and April 22, 2019.
and impact the positive leadership of the future!